In 2008, Spencer's Coffee owners Justin & Shelley Shepherd found out that their 2-year-old son, Lewis, had Autism Spectrum Disorder; a few years later, their second son, Owen, was diagnosed as being on the spectrum as well. And because Justin & Shelley know firsthand the struggles of raising children with autism — and the challenges faced by these courageous kids — Spencer's works year-round to help further the cause of autism awareness and the efforts of those helping families who deal with autism. Every April is Autism Awareness Month, and at Spencer's, that means Owen's Orange Sodas and Lewis Lattes on the menu. Owen's Orange is an Italian soda made with mandarin and coconut flavors, while the Lewis Latte adds a bit of toasted marshmallow flavor to our already popular espresso drink. $1 from the sale of each of these drinks goes to an organization that's helping the autism community; this year's beneficiary is the Renshaw Early Childhood Development Center at WKU, whose "Big Red School" has been attended by both Lewis and Owen. Below is an article Shelley wrote for this month's SOKY Happenings magazine, detailing the challenges and blessings of raising kids on the spectrum. We hope you'll find time to come grab one of these delicious drinks this month; you may even see Lewis (now 7) or Owen (now 5) running through the store for their afternoon pick-me-ups! And if you suspect your child may be on the autism spectrum or need help identifying developmental delays, feel free to email shelleygwen@gmail.com — she may not have the answers you need, but she'll definitely direct you to people right here in southcentral Kentucky who do. Starting Monday, Dec. 30, and continuing until the week of Jan. 13, Spencer’s Coffee will be serving the “Drink” side of our menu (coffee, espresso drinks, chai, etc.) 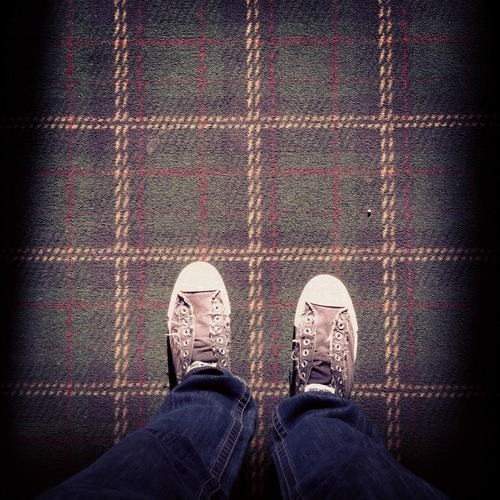 out of the lobby next door. Drinks will be to-go only, and we’ll be open 7a-3p M-F and 8a-3p Sat. Whole-bean coffee will also be available. If you’ve been by in the past couple weeks, you’ve likely heard a bit of noise coming from the back end of the store. And if you’ve headed for the restrooms, you’ve been sent down a new hallway to a previously unseen part of the building. 1.) More “operational capacity” (i.e. physical space in which to make delicious stuff for you). Our kitchen has never been roomy, but over the past year or so it’s become nearly impossible to keep up with orders during busy lunches or other peak times. Our storage is maxed out, our layout designed a decade ago for far less volume. And we’ve got some new items we’ve been itching to try, but have hesitated because of the space issues. This renovation should fix all that and more. 2.) More seats. That big, bold orange wall? That’s going away — and the dead-space hallway and poorly designed rooms behind it are already gone. Instead, there’ll be about 30 new seats (two-person and four-person tables, and a laptop bar that should seat 5-7). 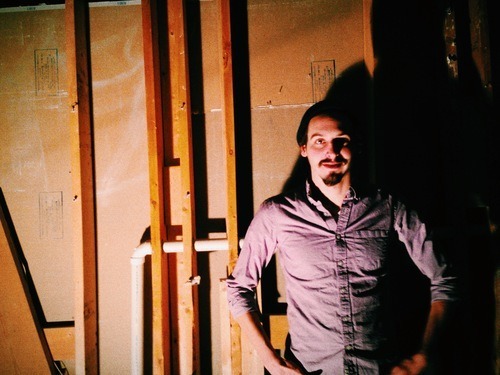 We’re investing a lot of time, money and effort into this project, and we’re hopeful it’ll be finished by January 13. And we’re so thankful that Bowling Green has embraced our vision for a great place with great food and drink — you are the reason we continue to grow. We hope you’ll keep your coffee business with us over the next couple weeks, and keep your patience with us as our kitchen and seating are closed during the remainder of the renovation. And we can’t wait to unwrap our belated Christmas present for you, just as soon as the elves are done working. On Nov. 7, for the second year in a row, we hosted the KY/TN Latte Art Throwdown & Caffeination Celebration — a chance for baristas from Louisville, Nashville and everywhere in between to talk (and taste) coffee, and a chance for the public to see the levels of coffee nerdery possible in our little industry. Hugs were exchanged, coffee stouts were drunk and many lattes were poured, with all proceeds going to the Center for Courageous Kids, an awesome organization in Scottsville that runs a year-round camp for kids with physical and developmental disabilities. Over the course of the evening, we raised over $500 for CCK — and we had a ton of fun doing it. The highlight of the evening was the second-annual KY/TN Latte Art Throwdown, a chance for baristas to compete in a bracket-style format to see who could pour the prettiest drink. Last year, John Newman of Crema Coffee in Nashville took home the gold (and some sweet prizes), but Louisville vowed revenge. Kenny Smith, equipment specialist of Sunergos Coffee (and education & equipment consultant for us), won this year, taking home a brand-new Encore grinder courtesy of Baratza, along with some extra goodies from Visions Espresso, Mistobox and Barista Magazine. Meanwhile, his longtime friend and former colleague Darren Jennings (blogger at The Coffee Compass) placed second, taking home a Kalita Wave dripper and Pelican Pot kettle, among other things; Miller Houston of Quills Coffee in Louisville placed third, grabbing a Prima Tamp from Prima Coffee. 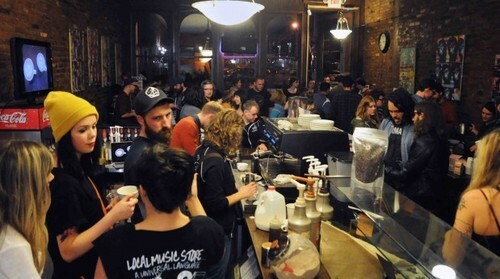 The place was packed, and barista and bystander alike had a blast. Thanks to Baratza Grinders, Kalita USA, Prima Coffee, Visions Espresso, Mistobox, Barista Magazine and Sunergos Coffee — and thanks to all who dared enter the throwdown, and all of you who were able to make it! We’ll see you here again next year. We don’t carry a lot of gadgets, but we stand solidly behind the ones that we do. And we’re happy to announce we’re now stocking the AWS SC-2KGA digital scale. Small enough for your pocket, classy enough for your kitchen and accurate enough for a chemistry lab, this little scale outperforms anything you’ll find elsewhere in southcentral Kentucky, and at a ridiculously reasonable price. More details below, but first, you might be asking, “Why do I need a digital scale?” Three reasons. 1.) Weighing is better than scooping. To brew consistently delicious coffee, you need to know how much you’re brewing. Using a “coffee scoop” or a spoon to guesstimate doesn’t cut it — some coffees are much more dense than others, and the only appropriate way to figure out how much water you need is by starting with how much coffee, by weight, you’re going to brew with it. 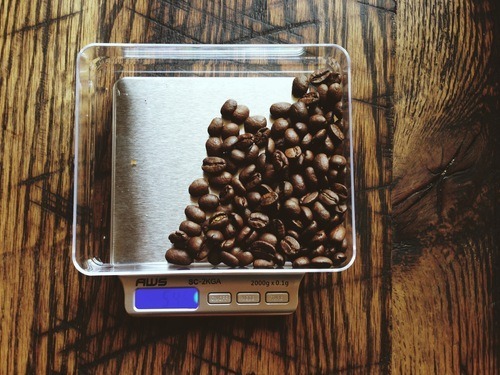 Scales like the AWS SC-2KGA measure coffee to one-tenth of a gram, so you can brew confidently and accurately. 3.) Secondary uses galore: Just because you buy it for coffee doesn’t mean you can’t use it elsewhere. An accurate digital scale is great for baking — and if you decide to go all Walter White, well, this’ll work great for that too… just don’t tell anyone where you got it! We use the SC-2KGA to prep the espresso that goes into every drink we serve; it’s also the scale a number of us use in our own kitchens. 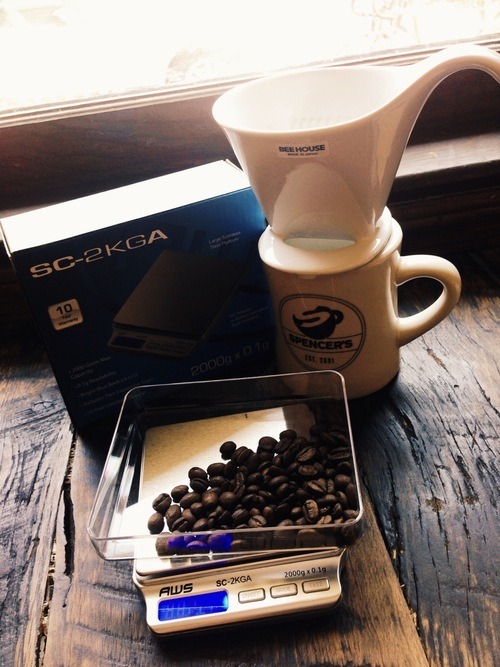 With an included weighing tray, safety cover and AC adapter, it’s a scale that’s perfect for bumping up your coffee IQ. And at just $30, it’s the most affordable-yet-accurate scale you’ll find anywhere. So go ahead, nerd out! It’s not actually nerdy, and the investment will pay for itself in improved coffee brewing in your kitchen. The rumors are true: Spencer’s will be hosting the occasional afternoon of spirited sippage throughout the summer and fall, and it all begins at 4p Thursday, Aug. 1. Bell’s Brewery of Michigan will be the featured brewer, and we’ve chosen two of their most popular offerings to kick off our Projekt Beergärten concept. The first is Two-Hearted Ale, a hoppy, malty IPA with fruity aroma and surprisingly smooth finish. The other is Oberon Ale — not only is it one of my personal favorites, but its balance of malted wheat and citrus is perfect for the temperature and temperament of summer. It’s a simple concept — great beer in a relaxing environment, away from the noise and bustle of a typical bar or the formality of a full-service restaurant. And it’s something we’ve longed for in downtown Bowling Green, so we decided to take it upon ourselves to create it. We’ll be featuring different beers throughout the season, and we’ll switch up the days and times. We’ll keep you informed (via Facebook and Twitter) on upcoming Projekts, and we’ll remain open as usual inside Spencer’s for your nourishment and caffeination needs. So grab a friend (or two, or ten) and join us on Thursday, Aug. 1 for Projekt Beergärten, in the courtyard just out the back door of Spencer’s Coffee. After all, everyone needs to relax sometimes. PS: If you’re wondering whether this means Spencer’s is now “a bar,” rest assured that it does not. We do anticipate offering a very limited selection of craft beers in our daily operation, expanding our already diverse menu of casual dining options. Sleep easy knowing that we will not serve alcohol to anyone under 21, nor will we allow drunkenness or debauchery to ruin the great things we’ve got going on. Spencer’s is founded on the vision of providing great coffee and food in a relaxing environment, and doing it in a way that appeals to people in all ages and stages of life — and though we change a lot of things around here, that’s a vision from which we’ll never stray. While temperatures in BG were spring-like, we awoke Friday morning to inches of snow and blistering winds. 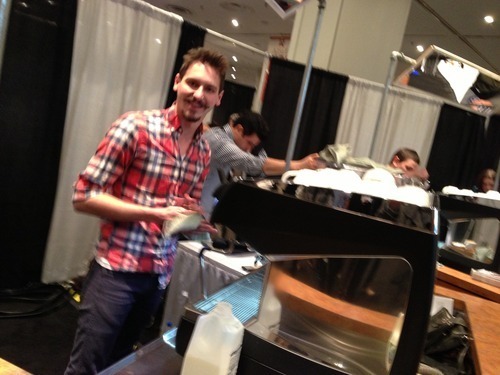 Nate tidies up after his pour in the World Latte Art Open. Only 64 competitors were accepted; Nate had the bad luck to draw Asaf Rauch of Israel in the first round. 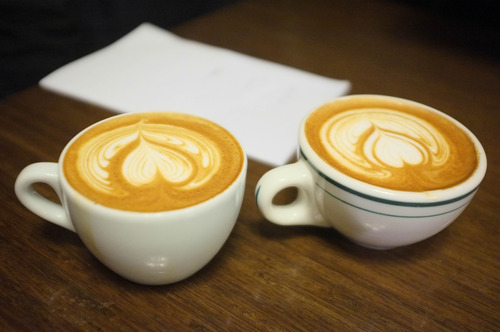 Nate’s pour is on the right — while solid, it couldn’t match the symmetry, difficulty and rock-solid execution of Asaf’s ultra-difficult 10-layer tulip. 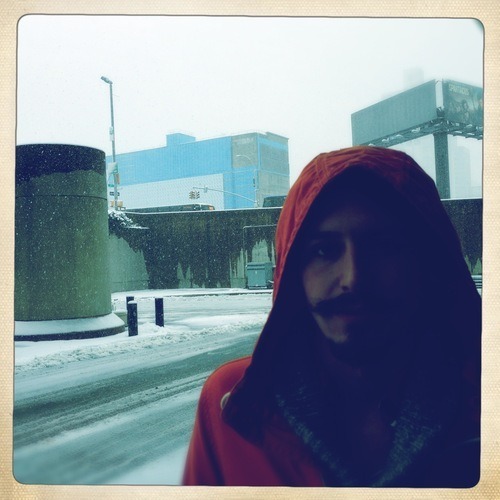 (Asaf would go on to the final 8). 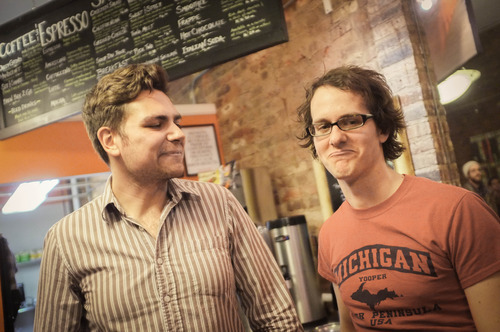 Nate and I were honored to act as “Customer Judges” for the America’s Best Coffeehouse competition. Cafés from around the country sent teams of three to show off their service, hospitality and coffee-making skills under pressure of constant critique. 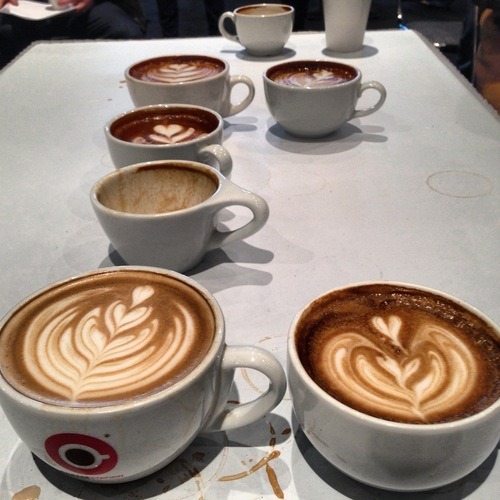 Peregrine Espresso of Washington, D.C. took home the title — and we started plotting our own entry into this competition! 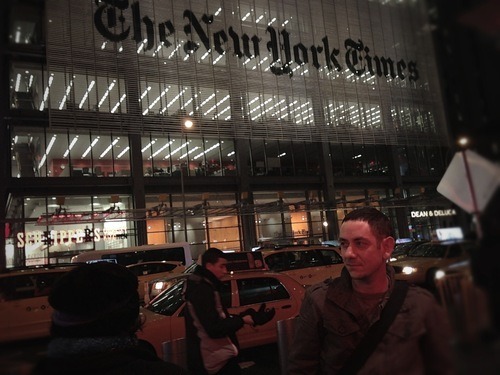 No trip to New York City is complete without some sight-seeing… behind me is the New York Times building, along with a coffee chain made famous in the hit TV show “Felicity”. 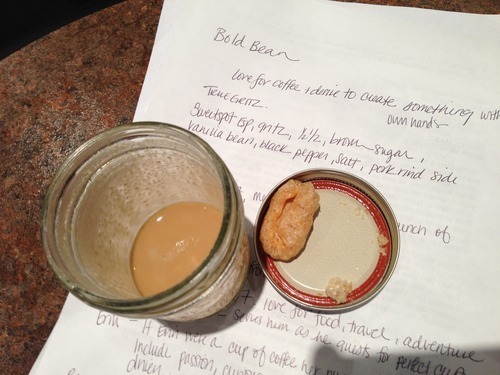 Talk about “bold coffee”: This was the most interesting drink we tasted all weekend, as part of the Best Coffeehouse competition — an iced latte made with gritz, brown sugar, vanilla bean, salt and pepper, garnished with a pork rind on the side and served in a Mason jar. 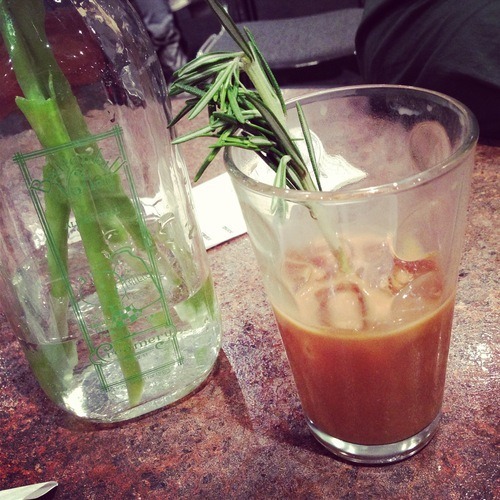 And here’s one of the best “special drinks” we had all weekend — an iced coffee beverage made with cold-brewed coffee, Thai iced tea and condensed milk, with a spring of fresh rosemary to add aromatics. Expect to see us introduce a variation on this creation (by Nolita Mart in New York City) this summer! All in all it was a wonderful trip — great to interact with the global coffee community, and a breeding ground of new ideas for improving what we already do here at Spencer’s. Loaded Blueberry Scones are back, but they won’t last long! At the core of every cappuccino, latte and mocha we serve is a small but potent shot of this incredible coffee. Roasted medium-well, Spencer’s Espresso Blend works great as a drip brew, too! Aromas of cane sugar and caramel, notes of chocolate and a rich, full body make this a great everyday drinking coffee — and we keep our shelves stocked with it for your home-brewing enjoyment. Dymaxion. : The rarest fruit in Indonesia, and how it changed the way I talk about coffee. A great read on coffee’s origins, the words we use to describe coffee, and the reason it all matters. 1.) CONSISTENCY: Where filter brews can be finicky — grind coarseness is dependent on how much you’re brewing, and water distribution (where you aim while pouring) is of the utmost importance — French presses are just plain easy. Once you find the right grind (generally, a coarse one), it’s as simple as adding 200ºF water, setting a timer, and plunging when the timer beeps. Keep the details consistent and your coffee will be consistent as well. Simple! 2.) BODY: Where filter brews tend to bring out subtle nuances in coffee’s flavor, the French press mutes acidity (tanginess) and replaces it withbody. Science lesson: coffee oils and coffee dust (called “fines”) combine to form what are called “brew colloids.” These colloids are what give coffee its mouthfeel, but paper filters drastically decrease them. In a French press, however, these colloids are given free reign — making for a thicker, “bolder” cup of coffee. You can even see the colloids on the surface of press-brewed coffee — it makes for attractive pictures! They’re why pressed coffee tastes “thicker” than filtered brews; and the aftertaste of pressed coffee, while sometimes a bit harsh, leaves a long-lasting linger that filter brews generally can’t. 3.) SIZE: At this very moment, using two large French presses, we’re able to crank out 3 liters of coffee in just under 5 minutes. There’s no other feasible way to do this, outside of a commercial machine. And while you might not need 3 liters of coffee on demand, a French press is great for dinner parties, long study sessions, or anywhere else you need a lot of coffee but don’t have room for bulky, expensive equipment. Above is a picture (taken from Sweet Maria’s) of the same batch of coffee beans, pulled from the coffee roaster at different points in the roasting process. No. 1 are the beans before they’ve been touched by heat; No. 16 is what you might call “Spanish” roast, in which every possible desirable flavor in the coffee has been burnt out of the beans. Roast level plays a big part in the flavor of coffee, but let’s clear up a big misconception: Roast level (“light” or “medium” or “dark” or “French” or “Italian”) shouldn’t be viewed as a preference in the way that, say, “rare” or “well done” are viewed in terms of steak. In fact, for any particular batch of coffee beans, there’s likely an optimum roast level that will bring out the most desirable flavors while contributing the fewest undesirable characteristics. At Spencer’s, you’ll generally find that we don’t describe our coffees based on roast level — African coffees tend to taste best when roasted light (somewhere between No. 6-9 on our above graphic, where South American coffees taste best in the 10-12 range. The coffee industry has done a poor job in the past few decades, misleading customers into perceived preferences based on roast levels instead of inherent flavors. Believe it or not, a good Ethiopian coffee should taste of citrus or berry; if it doesn’t, then the roaster probably didn’t do the best job with the beans. Similarly, a Colombian coffee that doesn’t have a snappy/tangy finish was probably over-roasted; as a result of years of this sort of thing, a lot of coffee drinkers have come to believe that coffee should taste very smoky, very bitter, very heavy on the palate. Hence the need for copious amounts of cream and sugar to improve the taste! There’s still much more to consider as regards the flavor of coffee: In the coming days, we’ll talk freshness, filtering, and “acidity” — one of the most misunderstood words in coffee. In the meantime, mark your calendar for this Wednesday at 2 p.m., when we’ll host a brief, fun Coffee Clinic that’ll touch on a few of the flavor concepts we’ve been blogging about. The picture above is the “Coffee Tasters Flavor Wheel,” an industry-standard illustration of the most common tastes and aromas potentially present in coffee. The left side describes potential “tasteable” flavors — things that your tongue can register — while the right side describes aromas, perceptible by our noses. What’s interesting is that all the really identifiable flavors — blackberry, dark chocolate, clove — show up on the “aroma” side of the wheel. 2.) When we (or anyone) describe a particular coffee in terms of its “notes” and “undertones,” what we’re doing is not so much pinpointing exact flavors, but rather filtering the coffee through our experience of all the tastes and aromas we’ve saved up in our memories. Thus a baker may be able to better discern and differentiate flavors in the “Sugar Browning” category of the wheel, while a gardener more easily picks out the flavors on the “Enzymatic” end of the spectrum. There’s a TON to say on flavor, and over the next few days, we’ll look into some of that. But for now, don’t fret if you’ve never tasted balsamic rice or coriander seeds in your coffee — we’re not sure we have, either. Instead, next time you pick up your cup for a sip, slurp it and chew it and swish it and smell it, and see where your mind goes. Because flavor, after all, really begins and ends in your head. What’s a macchiato? Depends on who you ask. At Starbucks — and, by extension, coffee shops run by people who base their model on Starbucks’ — that word will likely get you a “Caramel Macchiato,” which is oddly named, since theirs is a vanilla latte with a bit of caramel drizzled on top. And while Starbucks’ success and ubiquity has helped the coffee industry as a whole, the whole “macchiato” thing can still be confusing. Here’s the definitive word: A Macchiato is a healthy dose of espresso (1-2 oz. ), with a smaller portion of steamed milk added to the top. The word itself means “to mark” or “to stain” — hence, the espresso is stained with a bit of milk. Typically, a macchiato is served in a 3.5 oz ceramic cup; an expert barista can pour a pretty heart on top (milk art being a sign that the milk, at least, has been prepared well, since badly textured milk won’t pour into a decent shape). Some shops like to spoon light, foamy milk onto the top of the espresso, but we prefer a more substantial, liquid texture that’s poured in (and hence mixes with the coffee). The picture above is a macchiatto from Stumptown Coffee in Seattle, one of the specialty coffee world’s benchmarks for quality. The flavor of your macchiato will be dependent on the espresso used; in ours, you’ll note typical chocolate flavors, along with undertones of fruits and nuts (think a dried-fruit trail mix). The milk tones done the acidity and tang of the espresso, but the natural sweetness of the milk provided a compliment to the snappier flavors of the espresso. It’s a delicious treat: Short and simple, meant for sipping but not meant to last. A reminder that some of the best things in life don’t last too long — and, at its best, a moment in time in which taste is king, and everything else can wait a minute. Cheers! The most important piece of coffee brewing equipment is not a coffeemaker — it’s a grinder. Grinders are what allow our delicious coffee beans to be crushed into brewable pieces, and the resulting flavors of your brew will be directly related to the quality of your grinder. Please, hear us on this: A “coffee grinder” with blades, like the one pictured above, is not a grinder at all. Rather, it’s a chopper. A cheap food processor not unlike those sold for the low price of $9.99 — but wait, there’s more! — on many an infomercial. What you want in your house is a burr grinder, so named because a pair of burrs spin ‘round, shoving the coffee through their teeth and resulting in (ideally) a uniform shape for the coffee bits at the other end. If you’re serious about your coffee obsession, choose Baratza; this company makes the best home grinders on the market (starting at about $150), and will happily send replacement parts (and instructions on repair) should something happen to your investment. Cheaper still is the Capresso Infinity, which we had in our house for a while and did an above-average job for an $85 grinder. Starting around $55, Krups is the cheapest that we can recommend, though the $30 extra you’d spend on the Capresso is well worth it in terms of uniform grind size. But please: Before you spend another dime on a different coffee brewer or some other wonky kitchen device that’ll eventually gather dust in your cabinet, invest the money to buy a decent coffee grinder. You’ll taste the difference instantly. A common saying around these parts: “There’s more than one way to skin a cat.” We don’t have much experience with that — cats are cute, and we don’t know why anyone would want to skin one — but we have a similar saying. There’s more than one way to brew great coffee. In fact, there are a ton of ways to brew great coffee — multiple ways, in fact, for every different brewing apparatus. And while we’re happy to give in-person instructions on our favorite methods, we wanted to make you aware(see what we did there?) of a great resource for just about every brew method out there. It’s called BrewMethods.com, and it’s chock full of instructional posts (and plenty of videos!) that’ll get you one step closer to the perfect cup of coffee. Got a Moka Pot? We don’t use them much, but BrewMethods has multiple recipes to get you started. Want to dust off that siphon you found in grandma’s attic? BrewMethods can help you with that, too. Poke around a bit, and you’ll find helpful hints on nearly every brewing method — and, just maybe, a little inspiration to turn off the auto-drip and take matters into your own hands. On a day that many of you spent at church, we should take a moment to pay tribute to percolators — those shiny, bulky brewers of bitter beverages that were staples of many a Sunday school class. Though no coffee lover worth her salt would choose one of these devices nowadays, the percolator was a significant advancement in coffee that led directly to the crisp, clean paper filter brews we typically enjoy today. The percolating coffee pot was invented by the British scientist and soldier Count Rumford, otherwise known as Sir Benjamin Thompson (1753–1814). He invented a percolating coffee pot following his pioneering work with the Bavarian Army, where he improved the diet of the soldiers as well as their clothes. It was his abhorrence of alcohol and his dislike for tea that led him to promote the use of coffee for its stimulating benefits. For his efforts, in 1791, he was named a Count of the Holy Roman Empire, and granted the formal title of Reichsgraf von Rumford. His pot did not use the rising of boiling water through a tube to form a continuous cycle. Until that time, coffee brewing was either inexact (grounds immersed in water, a la French press) or complicated (siphon/vacpot brewers). Percolators made coffee easier, and generally tastier, though “advancements” aimed at keeping the coffee hot led to the overextracted, overly bitter brews most of us remember coming out of these machines. The principle — “percolation,” meaning water passing through solids (coffee) to extract part of those solids into water — persisted, and is still the most common way we brew coffee. So when the Melitta company invented paper filters in 1903, they were working to advance a method that was born alongside the percolator. And we should be able to toast to that! Follow these rules. Today! Your taste buds will thank you. Behold the Chemex Coffee Brewer. Invented nearly 70 years ago by a somewhat mad scientist, this simple-yet-elegant piece of glass still makes some of the best brewed coffee around. Available in 3-cup, 6-cup, 8-cup and 10-cup sizes, all you need is the vessel ($50 or less), hot water, and the specialized Chemex filters ($10 or so for 100). You might be thinking, “That’s a lot of money for filters!” But the filter is the actual innovation: Made from ultra-heavy paper and then oxidized to reduce paper taste, Chemex filters block almost all the oils, sediment and “fines” that make their way into most other brews — and the result is the cleanest, lightest-bodied coffee that you can make. Like coffee with your cream and sugar? Then the Chemex may not be for you. But if you want a pure coffee experience with a side of modernist style, then a Chemex should definitely be in your brewing arsenal. It’s a great conversation piece (and can double as a fabulous vase — just ask my wife!) and works well regardless of whether you want coffee for one or for four. Just grind “medium” (think the size of cracked pepper) and slowly add hot water — it takes about 4 minutes, but it’s well worth the time and effort. You’ll taste nuances in your coffee that you’ve never noticed before, and cleanup is a breeze. 70 years old, but it tastes new every morning to us. 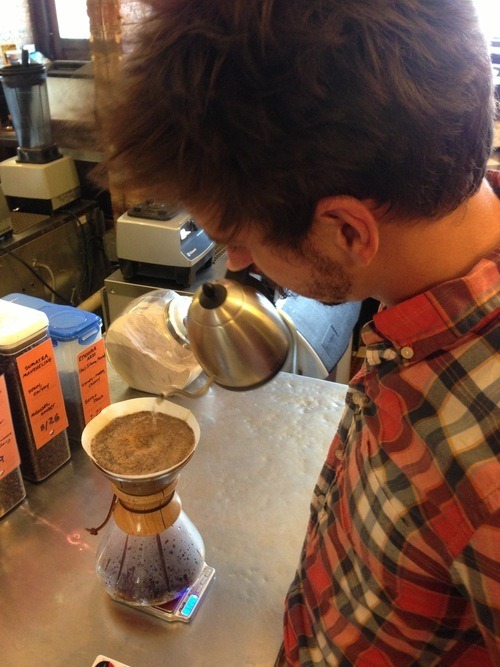 For more on the Chemex, including a pretty good brewing guide, check out this 2010 article in the New York Times. Visit us at 1 p.m. this Saturday for “Better Brewing at Home,” a free demonstration and tasting at Spencer’s Coffee. We’ll be brewing with the Chemex, as well as one or two other devices, and experts will be on hand to answer any questions or concerns! (A) goat-herd, Kaldi, who, noticing the energizing effects when his flock nibbled on the bright red berries of a certain bush, chewed on the fruit himself. His exhilaration prompted him to bring the berries to a Monk in a nearby monastery. But the monk disapproved of their use and threw them into the fire, from which an enticing aroma billowed and the monks came out to investigate. The roasted beans were quickly raked from the embers, ground up, and dissolved in hot water, yielding the world’s first cup of coffee. The Ethiopian ancestors of today’s Oromo ethnic group, were the first to have recognized the energizing effect of the native coffee plant.